1. Tell us a bit about yourself—what’s your background and how did you become a writer? My name is Cris Pasqueralle, and I am Long Island born and raised. I currently live in Levittown, NY with my wife, Tricia, and my two daughters, Toniann and Deanna. I am a retired NYC police officer, and I have always wanted to write. I began writing stories while in high school, and it was my daughter’s love of fantasy fiction that led me to write The Destiny Trilogy. 2. What is the genre in which you write? I write middle grade/YA fantasy. 3. What is the book you recently published? What is it all about? My most recent work is Destiny Revealed, book one of The Destiny Trilogy. It follows the story of 13-year-old twins Jack and Maddie Austin who, during their birthday celebration, see their parents kidnapped by the evil wizard: Tardon. Then, they are whisked away to an unknown, magical realm by their Uncle Benny, where they learn they are wizards with a great destiny. They embark on a rescue mission to save their parents, and learn the truth about who, and what, they are. 4. Have you published or written any other works? Destiny Revealed is my first published work. 5. Name your favorite characters you’ve made up and explain why they’re your favorites. My favorite characters are Jack and Maddie, and Connie, from Destiny Revealed. I like Jack because he is a lot like I was at 13, and Maddie and Connie because they are modeled after two of my favorite people: my daughters. 6. Do you ever get writer’s block? If so, how do you deal with it? I will get a lot of backlash for this answer, but I don’t think there is anything such thing as writer’s block. I believe that it’s simply the characters telling us they are not ready to move on. I keep the flow of writing by stopping when I am on a roll. This way, when I return to writing, I already have something to work with and I’m not staring at a blank page. 7. How long did it take to finish your first novel? My first novel took nearly a year to get it to the point where I thought it would be presentable. 8. What were the challenges you faced when getting your first book published? Initially, I wanted to go the traditional route, get an agent, and shoot for one of the big publishing houses. But after many, many form letter rejections, I found that I could self-publish direct to Kindle, which I did. Then, my luck changed, and Braxton Cosby, from Cosby Media Productions, saw Destiny Revealed, and thought it was a good fit for CMP. We pulled it from Kindle, reworded and copy-edited it, and re-released it—with much success. 9. How do you market your work? What avenues have you found that work best for your genre? I market mostly through social media and found that Facebook readers’ groups, as well as Google+, and Twitter help me to target directly to fans of fantasy fiction. 10. What does your writing process “look” like? My writing process is old school: a notebook, a pen, a cup of coffee, and usually a baseball game on in the background, or some music from the golden oldies. Currently, I am working on book three of The Destiny Trilogy, but I have some ideas for a couple of stand alone novels, and two other series I’d like to get going on. 12. What has been the toughest criticism given to you as an author? What has been the best compliment? The toughest criticism has often come from people I know who say, “You’ll never make a living doing that.” I’ve also had a couple of reviews that said they had trouble connecting with the characters and wouldn’t want to continue with the series, but those have been few, thank goodness. The best have been two reviews that have compared my work to the Harry Potter books. One said: “The next up and coming Harry Potter and Percy Jackson,” and another said: “Move over, Ms. Rowling; there’s a new fantasy author in town.” Still, another called Destiny Revealed “Something akin to, but different from, Harry Potter.” Those types of comments I find very encouraging and flattering. 13. What advice can you give to aspiring authors? The advice I give to aspiring authors is to read everything, and keep at it. I tried for nearly thirty years to get published, and it finally happened. So, keep writing, no matter what anyone says. 14. When can we expect to see another publication of your work? Gook two of The Destiny Trilogy, Paths of Destiny, will be available as an eBook later this summer. 15. What’s a cool (or nerdy) fact about you that you’ll share with us? I’m not very cool, so there aren’t many cool facts about me. But a nerdy one is that I still enjoy cartoons; they crack me up. Please excuse me while I fangirl a bit. Today, I’m hosting C.F. Waller, author of Free Dive–hooray!! And, if you can’t already tell, I am a big fan of his work. I had the privilege of editing Free Dive last year when Cosby Media Productions acquired it. (YOU REALLY NEED TO READ THIS BOOK, OKAY??) Since then, I’ve become giddy any time I get to read something by Waller. (In fact, I’m editing one of his next releases, Palindrome 656, which will be released this year by CMP.) But let’s move on to the good stuff—my interview with Mr. Waller. Enjoy! When did you first realize you wanted to be a writer? Growing up, my house was book shelves—one on almost every wall. I was reading novels in the third grade during recess. I used to grumble about the plot lines as if I had a better idea. It wasn’t until the last six years I had the time to write, but I always wanted to do it. What inspired you to write your first book? Michael Crichton: The first adult novel I ever read was The Terminal Man. In my opinion, his techno-thrillers are the best example of that genre ever. I also have a soft spot for Oscar Wilde. What genre do you consider your book(s)? I have been exploring a few. I never want to write the same subject matter twice. So far, I’ve written one Space Opera, one Time Travel, one techno-thriller, one Paranormal and my new work in progress is about Immortals. I always change the locations so I learn about a new thing. What is your work schedule like when you’re writing? I walk in the morning, have lunch, and then have all afternoon to write. I never write if I am not in the mood. Forced page counts or writing through a block produce a bad end product. Sometimes I go a week and don’t work, but when the stories come, I will write 6-7 hours a day. What would you say is your interesting writing quirk? For the most part, I over-research locations. Sometimes you have to make the ideas fit a timeline or a place fit a scene, but I try to be spot-on as much as I can. I can sit down to write and get lost in research, winding up with no words at the end of the day. Do you have a specific writing style? Lots of dialogue, less describing. How did you come up with the title? Every book gives me a title as I write it. Oddly, my new project is the first one that has gone to beta readers with no set title. I do adhere to a two word title rule. If I can’t come up with a two word title, something is wrong with the book for me. Possibly, it’s over complicated. Is there a message in your novel that you want readers to grasp? I never start out with one. I have had readers tell me they got the message. Often, several readers get different messages. People all have different brains and they fill in the blanks from their own experiences. Good for them, as they become part of the story. How much of the book is realistic? As much as possible. On the Everest climbing book, I went so far as to talk to an actual climber who made the summit. On Free Dive, I watched a dozen documentaries on the subject. It’s important to me to be as real as the plot allows. Are experiences based on someone you know, or events in your own life? Not ever. I don’t write about myself or people I know. I do use places I have been or general stereotypes on actual people. Most often, I cast the movie in my head before I start writing, and then use characters from many movies jumbled together. It helps me create actual people, thus helping me decide what they might do in the book. How long did it take you to write this book? Free Dive took five months, which has been the case for my last three books. The new one might be a hair longer, and the first book took over a year. I have a step-by-step process now. Research, write, beta, re-write, beta, re-write, edit, publish. What books have most influenced your life most? The story of Dorian Grey – Oscar Wilde, One Second After – By William R. Forstchen, and anything by Michael Crichton. If you had to choose, which writer would you consider a mentor? Re-occurring answer . . . Crichton. What book are you reading now? Michael Connelly – The Drop. What are your current projects? Book about immortals, unofficially titled The Calling Tree. If you had to do it all over again, would you change anything in your latest (or first) book? Way too many things. I understand why Stephen Spielberg can’t resist changing things to his old movies. We all evolve and learn. Never plot lines; mostly semantics and mechanical things. Who designed the covers? 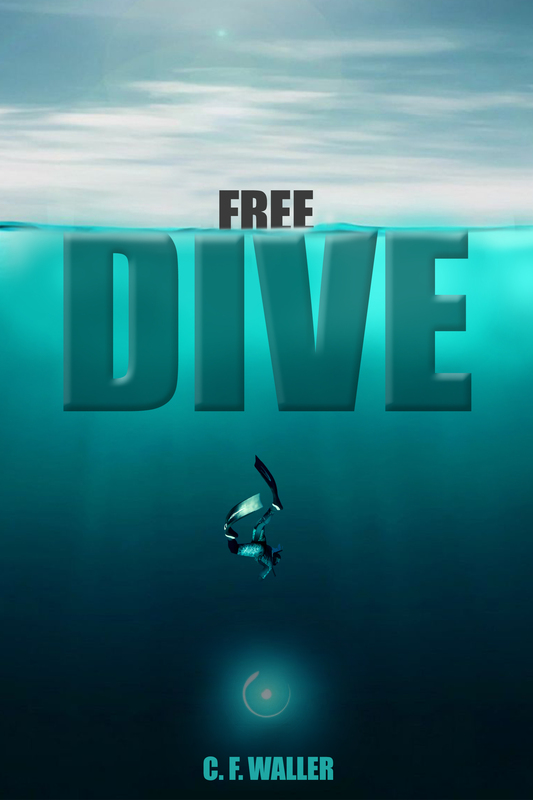 CMP did a wonderful new cover for Free Dive, but I have had original art done by people in the UK, Romania, and Bulgaria. I go where I find the perfect thing. What was the hardest part of writing your book? Cutting myself off of re-writes and letting go. The first book I re-wrote for a year before publishing it. An author can sometimes mess with a beautiful idea if they let it cook to long. Do you have any advice for other writers? Be original at all costs. I avoid whatever is in vogue. If the movie theaters are bursting with movies about certain subject matter, then I put it on the Do not write about that list. Sure, readers might be buying those type of books now, but I don’t want mine lumped in with a pile of books that appear to be knock-offs. This might rub some authors the wrong way, thus this is my personal feeling. Other authors, please write what you feel passionate about. Do you have anything specific that you want to say to your readers? Thank you for your time and please contact me with feedback (good or bad). Do you ever experience writer’s block? Rarely, but I don’t write in those circumstances. If you don’t have any good ideas to write, better to write nothing at all. Do you write an outline before every book you write? Nope. I take long walks daily (2-3 hours) and let my mind watch the idea as a movie. I watch it over and over ’til I have it how I want it and then sit down and let fly. Have you ever hated something you wrote? Every writer does, don’t they? I sometimes take an entire chapter and remove it. This can sometimes be good, as the deleted sections often become unseen backstory that I use to help my characters make decisions in the rest of the book. While you were writing, did you ever feel as if you were one of the characters? Nope. I keep myself out of the books. What do you like to do when you’re not writing? I’m active at church, serving in several areas. I watch too much television, especially reality cooking shows. My wife and I play very competitive Yahtzee. What does your family think of your writing? My wife is very supportive, but the subject matter is not her thing. Mother seems to enjoy it, and I don’t think my brother has read any of the books. What was one of the most surprising things you learned in creating your books? Everyone is like a crash course in the subject matter. It’s been like a masters class in space travel, time travel physics, deep sea diving, and mountain climbing. I suppose it helps me when I watch Jeopardy. Which actor/actress would you like to see playing the lead character from your most recent book? The first two books … probably Katee Sackhoff. Free Dive would be Shane Carruth (a Canadian director/actor), and South Face, more than likely Charlize Theron. What is your favorite motivational phrase or positive saying? Every day’s a school day. Thank you, Brian Stierle, for giving me that one. What advice would you give to your younger self? Tie down the ignition wire on the 1995 state finals car, don’t buy a motorcycle, don’t bet into a flush draw with trips, and never use 100 words when 5 will do. That won’t make sense to anyone, but that’s what I would say. Reading or writing? Reading my writing (egocentric much?). Writing during the night or writing during the day? Daytime for most; night to make sure you finish your idea from the daytime. Reading an eBook or print? Print. Buy books online or buy in a bookstore? Online, as it’s cheaper by far, but go to bookstores, if only for the smell. My local big box bookstore has a yogurt shop, and I love frozen yogurt. Writing from home or someplace else? Always home, and never when anyone else is home or awake. Weather: Hot or Cold? I live in Florida for a reason. Hot and full of palm trees. Music or Silence? When writing, silence. Classic Fairy tales or Fairy tale retellings? Classic. No Zombie Pride or Prejudice or Vampire presidents, please. Be original, not a piggy-backer. The Beach or the Mountains? Beach. The world being taken over by zombies or blood-sucking vampires? Neither. How about an EMP Apocalypse? Time Travel to the future or past? Always the past. Facebook or Twitter? I don’t understand Twitter???? Being able to fly or being able to go invisible? Invisible; airplanes fly already. Bookmark or Dog-eared? Finish the book all at once and you don’t need either. I do bookmark in the Bible, however. City or Country? In between. Coffee or Tea? Diet Pepsi. Charles published his first science fiction novel at age forty-seven, after a flight on an ill-fated commercial airliner over the Atlantic Ocean, that nearly became an episode of Why Planes Crash. This experience illustrated for him first hand that writing about exotic or dangerous locales was safer than traveling to them. Since then, he likes to think his meticulous research and storytelling gives readers a clear sense of their grandeur, without the inherent risk of flying. After narrowly escaping the academic death-grip of several universities, Charles worked in nightclubs, took a turn as a new car salesman, and also as a hurricane shutter engineer. His favorite authors include, Oscar Wilde, Kurt Vonnegut, Jr., and Michael Crichton. The latter being especially close to his heart as Crichton epitomizes the techno-thriller genre and and the failure of humans to interact with technology.